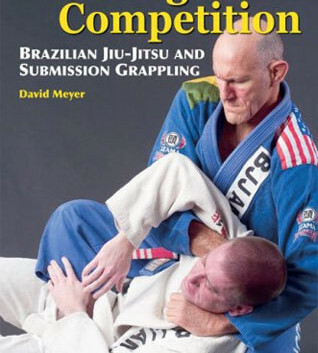 Training for Competition Brazilian Jiu Jitsu and Submission Grappling by David Meyer was first published in 2008. The book contains instructions, tips, and experiences that you can use to become a better competition fighter. David Meyer provides what seems to be a lifetime of useful information. In 1992, David Meyer joined the BJJ martial art. By 1997, under Rigan and Jean Jacques Machado, David Meyer became one of the first Americans to reach black belt and then quickly made his mark as a highly successful competitor. The following year, David Meyer became the first American to win a medal in the BJJ Championships when he won a bronze medal in the black-belt open-weight-class division. Continuing his winning ways, David Meyer earned a gold medal in 2004 at the Pan Am Games’ senior black-belt division. This is one of the few books I’ve read twice, back to back. The book provides benefits for new and experienced competitors. All 220 pages are beautifully illustrated and has an easy to follow format. Some of the finer features of the book for me include; interviews with icons of the sport including Nick Diaz, Cesar Gracie, and Bas Rutten to name a few, grappling conditioning tips, building your game plan, and a series of situational bases moves and techniques. There is also loads of sports physiology building material to help build the head game part of competition. I found the section discussing the day of competition preparation extremely helpful. This would be a great pre-comp ritual read for anyone. The section covering “learning to use the points and clock” is one of those you love or hate topics. On one end, you have the “fight to submit, nothing else matters crowd” and the “BJJ isn’t fighting to the death, it’s a competition with rules… so use them crowd”. The purpose of this review isn’t to give you my opinion, but to simply state that if your intentions are winning, especially at the higher levels, you’re going to find some important details for fine tuning your strategy. There are some great scenarios to help both crowds hear, so check it out. In conclusion, this book was a pleasure to read and learn from. A book I plan on reviewing pre-competition to prepare each and every time. I would highly recommend you pick up a copy and add it to your collection.